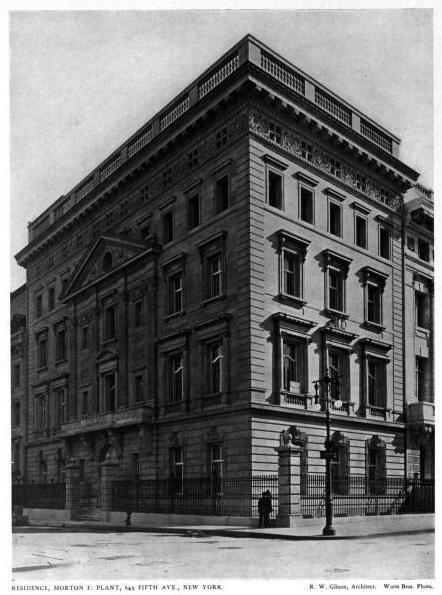 The Morton F. Plant residence designed by Robert W. Gibson c. 1905 at 651 Fifth Avenue in New York City. Since 1917 the building has been home to Cartier. The local tale says Cartier acquired the building in a trade with Plant's wife after he proposed to swap his most valuable two-strand pearl necklace, valued at $1 million, for the house, to which Plant agreed. In 1916 Plant sold the house to William K. Vanderbilt, owner of much of the block, and Vanderbilt in turn leased the building to Cartier. Plant had decided to sell and move uptown due to all of the encroaching business activity along the corridor. William Welles Bosworth followed up with some alterations and Cartier moved in that year. Click HERE to read Christopher Gray's Streetscapes article on the residence. Click HERE to see the Plant residence on google street view. Photo from Architecture, 1905. Okay I know this post is going to annoy someone around these parts. This townhome is remarkable as a survivor in midtown Manhattan and it really has beautiful, elegant details on the 2 main facades. It stands out from everything within the vicinity. Cartier has been a wonderful keeper of this gem. Now for the deluge.........Is it because it was a collaborative effort like Otto Kahns uptown home, so poor CPH wont get the credit he deserves? Okay I have braced myself and await the onslaught. I'm going to have to tread very carefully here---but it is interesting that with a collaborator Gilbert once again turned out a more interesting building. And while I hate to point it out, because truly I don't mean it argumentatively, but Gilbert was NOT a collaborator on the Kahn house. He was the supervising architect, which is something else completely, and not at all unusual---for a certified architect in an area to supervise the work of a non Gilbert has only been credited with the Kahn house design, inaccurately, since the 1970s, when someone writing a guidebook saw his name on the plans. I'm not trying to take something from Gilbert here, it's just simply that he didn't design the Kahn house. Stenhouse did. Curious to know more, I just googled Mr. Gibson, and find that though, unlike Stenhouse, he had an extensive New York practice, he was also, like Stenhouse, English, and likely needed the collaboration of a licensed architect in New York for his plans to be approved. Educated guess, but probably not too far from the truth. The Cartier mansion, is a decidedly more controlled and robust composition than most work solely attributed to Gilbert. I really didn't intend this Gilbert joke to go on so long or so far. I originally raised objection to the concept that Gilbert belongs in the first string (and still do). His buildings are often interesting, and undeniably elaborate, and I believe the New York streetscape is richer for the presence of several of them, but elaborate means nothing if it isn't accompanied by a sure sense of proportion, of design integration, and of planning flow (his floor plans are notably stiff), and that rarely happens with his buildings. On his very best days, he only reaches the level of the slow days of designers like Hunt, Platt, McKim Mead etc., Carrere & Hastings and a dozen others who do belong in the pantheon. Elaboration alone doesn't good architecture make. You can put lipstick on pig, but it doesn't make it Heidi Klum. Sometime, put two browser screens up. then put the entrance facade of Whitemarsh Hall in one, and the entrance front of Winfield in the other. Compare them side by side. While Whitemarsh is slightly dull, it is a lesson in proportion, and the awkwardness and flaws of Winfield become glaringly evident. Both are houses 13 bays wide, with central porte cochere, and projecting end pavilions, and balustraded roofs hiding a flat roof third floor. If one compares the floor plans, the inequality is even greater---Winfield is a series of boxes---no interlocking spaces, no imaginative manipulation of room shapes or vista, or even access. Whitemarsh is a progression of space and shape. And with that, I rest my case and declare a truce. So my question is this...where does poor CPH fit in to all of this? Neither Michael Kathrens in his book Great Houses of NY nor Christopher Gray in his article mention Gilbert as having anything to do with this building. I had always been under the impression Gilbert did have something to do with it, be it collaborative or supervising architect...but have yet to find anything to confirms it....just a lot of wikipedia and the like. I assume the building is an individual city landmark but I've yet to locate the designation report. Been a landmark since 1970...so that report is out there somewhere.... I will keep searching. Pembroke was one of Long Island's greatest losses...definitely in my top 5. The fact that I don't think Pembroke was a good piece of design is completely separate from my feelings about it as a wonderful fantasy---it was over the top, uninhibited and the very symbol of 'Better Nouveau Riche than Never Riche'. I too think it's a shame it didn't survive. Further research clarifies that the Plant house is by Gibson, and the now conjoined Holbrook house next door at 2-4 E. 52nd is by Gilbert, hence the confusion.